The Black Sea Region is a mountainous area in the north. This region is approximately 1/6 of Turkey’s total land mass. It has a steep and rocky coast and rivers cascade through the gorges of the coastal ranges. As the Northern Anatolian Mountains run parallel to the coastline access inland from the coast is limited to a few narrow valleys, so the coast therefore has always been isolated from inland areas. It is densely wooded, comprising more than one-fourth of Turkey’s forested areas. The region is mainly agricultural, corn being the dominant field crop. 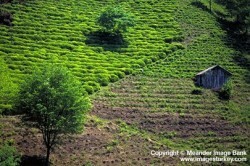 Tea is grown in the eastern coastal strip, hazelnuts around Giresun and Ordu and tobacco in Samsun and Trabzon. The Marmara Region covers the European part as well as the northwest of the Anatolian plain. It comprises a central plain of rolling terrain surrounded by mountains of moderate height. Although it is the smallest region after Southeastern Anatolia, it has the highest population density. The Marmara region is economically the most developed area of Turkey. Its agriculture is varied, including tobacco, wheat, rice, sunflower, corn, olives, grapes and natural silk. On the straits and coasts of the Marmara Sea fishing is well developed. The Aegean Region extends from the Aegean coast to the inner parts of Western Anatolia. Forest lands and fertile plains carrying the same names as its rivers are dominant. The lowlands of the Aegean and Marmara Regions contain about half of the country’s agricultural wealth in the broad, cultivated valleys, the most important of which are the Izmit Valley, the Bursa Plains and the Plains of Troy. Its wealth rests on the production of several export crops, including tobacco (more than 50% of Turkey’s total production), cotton (30% of the total), high-quality grapes suitable for drying, olives (more than 50% of the Turkish output) and figs. The Mediterranean Region is located in the south of Anatolia. The western and central Taurus Mountains suddenly rise up behind the coastline. Forest lands are dominant here like the Aegean and the Black Sea regions. The region has several subregions: the sparsely populated limestone plateaus of Taseli in the middle; the lake district in the west with its continental climate, where grain is grown; and the intensively cultivated, densely populated coastal plains. The coastal areas produce cotton (60 percent of Turkey’s output), sesame, citrus fruits (more than 90 percent of the country’s production), early vegetables and bananas. The higher elevations have relatively little arable land; grain and livestock are produced and there is pastoral nomadism among the Yoruks. The Central Anatolia Region is exactly in the middle of Turkey and is less mountainous when compared to the other regions. This region varies in altitude from 600-1,200 m (1,970-3,940 ft) west to east. Steppes are common. Geologically young volcanic features characterize the landscape. For the most part, the region is bare and monotonous and is used for grazing. But overgrazing has caused soil erosion on the plateau and during frequent summer dust storms a fine yellow powder blows across the plains. One-third of Turkey’s sheep and three-quarters of its Angora goats are raised there. The Eastern Anatolia Region is Anatolia’s largest and highest region. Nearly all of the area has an average altitude of 1,500-2,000 m / 4,920-6,560 ft. Anatolia’s highest peak Mount Ararat is located in this region. This is the most thinly populated region of the country. Farming is difficult because of the long, severe winters, steep slopes and eroded soil. Grain, chiefly summer wheat and barley, is the dominant crop. In the humid northeast, beef and dairy cattle are raised whilst in the south there are pastoral nomads who raise sheep and goats. The Southeastern Anatolia Region is notable for the uniformity of its landscape. Vast stretches of this region consist only of wild or barren wasteland. Agriculture is confined mainly to irrigated valleys and basins (wheat, rice, vegetables, grapes). Much of the population is nomadic or seminomadic. Turkey’s principal oil fields are here. Anatolia has a variety of soil types. Nearly 40% of the land, including the Black Sea coast and most of the northeast, is covered by red and gray brown podzols and by brown forest soils. The Aegean and Mediterranean coasts are characterized by mountain soils: Brown forest, terra rossa and rendzina. Chestnut and desert soils are found in Central Anatolia. The southeast has rich chernozems and chestnut-type soils. Turkey is surrounded by sea on three sides; the Black Sea in the north, the Mediterranean in the south and the Aegean Sea in the west. In the northwest there is also an important internal sea; the Marmara Sea, between the straits of the Dardanelles and the Bosphorus. The name of The Marmara Sea comes from the Marmara Island which is known for the high grade of marble from its quarries. The Black Sea coastline is 1,595 km / 990 mi long and the Mediterranean is nearly the same: at 1,577 km / 980 miles. Because the mountains reach the sea perpendicularly, the Aegean coastline has many curves and is much longer measuring 2,800 km / 1,740 miles. The Marmara Sea occupies an area of 11,350 km² / 4,381 sq miles and the coastline is about 1,000 km / 621 miles long. As a country surrounded by seas on 3 sides, Turkey has 159 islands most of which are not even known or inhabited. 109 of these islands are in the Aegean Sea, 26 in the Mediterranean, 23 in the Marmara Sea with only one in the Black Sea. With more than 300 natural and 130 artificial, Turkey is indeed a country of lakes. The total area of the lakes is around 9,250 km² / 3,570 sq miles and nearly 50 of them occupy areas larger than 10 km² / 3.8 sq miles each. There are also many smaller lakes which are usually not shown on maps.The largest, Lake Van is 3,713 km² / 1,433 sq miles and 100 m / 328 ft deep. Some lakes are fed by rivers whilst others form rivers by dispersing their excess water. Lakes which lose water predominantly by evaporation develop a build up of mineral salts which make them saltwater. The freshwater lakes are used for irrigation when their altitudes are higher than the plateaus around them. Lake Beysehir on the Konya plateau is an example of this. The lakes of Anatolia are not similar to each other either in size or formation. They can be divided roughly into 2 categories. These lakes were formed during the deformation of the earth’s crust. More than 20 of the major lakes in Turkey are of the tectonic formation. Because many of the roads or railways pass by these tectonic lakes it is possible to see many of them while traveling around Turkey. These volcanic lakes were formed when the bowl-shaped depressions around the orifices of volcanoes were filled with water after the eruptions. Since roads rarely pass through areas of volcanic formation, it is unlikely that many crater lakes of Anatolia are seen. There are many other types of lake formations which are not included here, such as glacier lakes, naturally dammed lakes and so on. More specific information about lakes which might be encountered while touring Turkey is provided in the Places of Interest Section. 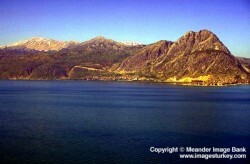 The selection of lakes mentioned is related to their interest value to tourists as opposed to their size or formation. These were mostly built within the last few decades to obtain energy, to provide irrigation for agriculture, and to provide drinking water to urban areas. The major power plant dams are the Ataturk, Karakaya and Keban on the Euphrates; the Altinkaya and Hirfanli on the Kizilirmak; the Gokcekaya and Sariyar on the Sakarya; the Demirkopru on the Gediz; the Kemer on the Buyuk Menderes and the Oymapinar and Manavgat on the Manavgat. Turkey is a country of highlands with an average altitude of 1,130 m / 3,700 ft. 80% of Anatolia is above 500 m / 1,640 ft in height which is much higher when compared to other continents. The average height in Asia is 1050 m / 3,444 ft; in Europe 330 m / 1,082 ft and in Africa 650 m / 2,130 ft.Except for a relatively small segment along the Syrian border, Anatolia is part of the great Alpine-Himalayan mountain belt. Generally, most of the mountain lines in Anatolia lie in the east-west direction. There are two important ranges of mountains in Anatolia: The North Anatolian Mountains along the Black Sea in the north and the Taurus Mountains in the south. Both of them run parallel to the coastline. The North Anatolian Mountains increase in height toward the east, where their highest peak, Kackar Dagi (3,937 m / 12,910 ft), is found. The Taurus Mountains rise to 3,734 m / 12,250 ft in the Aladag Chain. Composed mainly of limestone, there are caves, underground streams and potholes. 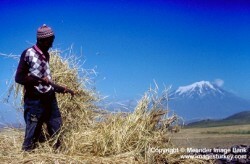 Anatolia’s highest peak is in the east: Agri Dagi (Mount Ararat) 5,165 m / 16,940 ft. Throughout history, water has always been a very important element for man in the development of his environment, for agricultural and industrial production, and for transportation. Therefore people prefer to live close to or in areas served by rivers.520 billion cubic m / 680 billion cubic yards of water (rain, snow, etc.) fall annually in Turkey and 32% of this amount forms rivers. Although this is a very large volume of water, not many of the rivers are very long. They are plentiful in number due to the existence of many hills, ranges of mountains, plateaus and plains in the country. Generally, rivers originate from heights of 1,000-2,000 m / 3,280-6,560 ft and flow into the sea after 700-800 km / 435-500 miles which is a comparatively short distance. Consequently their speed is fast and they carry large amounts of alluviums. These alluviums have contributed to some of the geological formations over the centuries. The harbors of some ancient cities such as Ephesus, Priene or Troy, which once graced shorelines, are present day ruins located a few kilometers inland due to silting up of shores. The lakes of Bafa and Sapanca were once bays before their entrances became closed by alluvium deposits. In spring, especially in April, the rivers carry the maximum amount of water which is muddy in color because it carries a lot of soil. The season in which the minimum water is carried is the autumn, especially September. The majority of the rivers in Anatolia are not navigable, having irregular, shallow beds and seasonal depth changes. Often many rivers are named according to their colors; Kizilirmak (red river), Aksu (white water), Bozcay (gray river), sometimes with the names of places or surrounding things; Degirmendere (mill river), Koprucay (bridge river), or with some adjectives describing the nature of the river; Delicay (crazy river), Cehennemdere (hell river), Ikizdere(twin rivers). Most Turkish rivers originate within the country’s borders, a feature which gives Turkey a strategic power because there is no risk of water limitation by its neighbors. The Euphrates and Tigris join together in Iraq and flow into the Persian Gulf. Less than half of the Euphrates and one third of the Tigris are within Anatolia today. The Kizilirmak (Halys) is the longest river originating and flowing within the borders of Turkey; 1,355 km / 842 miles. 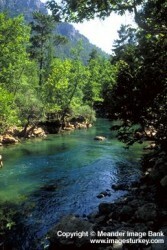 Yesilirmak and Sakarya are the longest rivers after the Kizilirmak, and flow into the Black Sea. The Aras and Kurucay flow beyond Turkey’s borders into the Caspian Sea in western Asia. The Susurluk, Biga and Gonen flow into the Marmara Sea. The Gediz, Buyuk Menderes, Kucuk Menderes and Meric flow into the Aegean Sea. The Seyhan, Ceyhan and Goksu flow into the Mediterranean Sea. Because of the geographical formation of the country with mountains that run parallel to the coast, Anatolia is a focal point of contrasting climates.While in coastal areas winters are mild and summers are moderately hot, the inland areas experience extremes of temperature. The hot summers have high daytime temperatures with generally cool nights and the cold winters have limited precipitation with frost occurring on more than 100 days during the year. In the Mediterranean, Aegean and Southern Marmara regions, the general Mediterranean climate is dominant; summers are hot and dry, winters are mild and rainy. Frosts are rare and snowfall is almost unknown. On the Northern coast of the Marmara Sea, the temperatures are lower. The Black Sea region, enjoys mild winters and a fair amount of rainfall throughout the year. In Central Anatolia, a typical plateau climate prevails where the summers are hot with minimum precipitation, and winters are cold with heavy and lasting snows. Villages may be isolated by severe snowstorms. Eastern Anatolia is rugged country with higher elevations, a more severe climate and greater precipitation than the central plateau. The climate of this region is most inhospitable. Summers are hot and extremely dry, winters are bitterly cold. Spring and autumn are both subject to sudden hot and cold spells. The rainfall is maximum in the middle and eastern coasts of the Black Sea and the western part of the Mediterranean. It is minimum around Lake Tuz and in Konya Plateau. Except for these areas and the Central Anatolia, the rainfall is average all over Turkey.